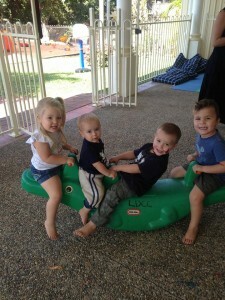 Little Diggers Community Centre (LDCC) in Cairns is a Defence-sponsored community group that aims to help Defence families feel confident, resilient and connected in Cairns. LDCC welcomes ADF and non-Defence families from all over Cairns, making it a great place to meet other local families, make new friends and catch up with some old friends. Our centre in Brinsmead is friendly, welcoming, air-conditioned and child friendly. 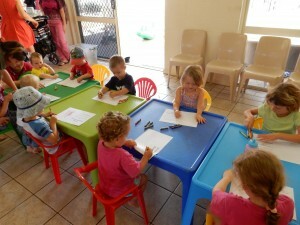 We have indoor and outdoor play areas, fully equipped kitchen and baby change facilities. With a large indoor area and fully covered porch area we offer year round entertainment for the children. The littlies have lots of fun and parents get involved too, with helping to prepare fruit, read stories, set up and pack up each session. Each year, we run activities and programs to give children and adults the opportunity to make new friends and receive support from other local Defence and non-Defence families. Family membership is just $12 per year and most events are low cost (and/or subsidised for Defence families). Tuesday 8.30am – 12.30pm, Thursday 8.30-12.30pm & Friday 8.30-12.30pm (closed on all public holidays). Physical Address: Brinsmead/Bella Vista Community Centre, Lot 14 Loridan Drive, Brinsmead QLD 4870. Little Diggers has a regularly updated facebook page. It is great to catch up on all the comings and goings of our organisation. To visit click here Facebook page.